Hanns Seidel Foundation (HSF) in the 6th year of its association with Centre for Social Research (CSR) has partnered on projects related to Water Conservation and Gender Mainstreaming projects, Safe Cities Project and Gender Sensitization of multiple stakeholders. As part of the Safe Cities Project last year, we undertook gender sensitization trainings of the Police Officials in the states of Karnataka and Jammu Kashmir. This year we covered Manipur and Pondicherry. The trainings sought to understand the problems faced or pre-empted by the police officials (communication and outreach given the legal complexities) and optimization of limited legal resources to sensitively handle survivors and their cases. It also covered topics such as theoretical concepts of gender, safe city and the linkage between the two. There was a dialogue on domestic violence, criminal justice system and the various aspects of law implementation agencies’ roles. The primary intention to conduct the police trainings was to give a theoretical sheen of gender constructs and a sociological approach to understanding the same. In order to do so, CSR and HSF felt it was imperative to undertake a Training Needs Assessment (TNA) that would fine tune the trainings as per individual states and their requirement. It was also to facilitate taking on board local resource people who would table the discussion in the two day training for each of the states. The training of trainers in the states of Puducherry and Manipur was followed by the Regional Consultation on 30th November 2017 in New Delhi. The Regional Consultation started with a welcome note by the Director of the Centre for Social Research, Dr. Ranjana Kumari and the Resident Representative of Hanns Seidel Foundation, Mr. Volker Lennart Pläen. Mr. Sanjay Beniwal who is the Special Commissioner for Airport, Modernization and Women’s Safety also marked the importance of the subject matter by giving a special message on women’s safety in the state of Delhi. 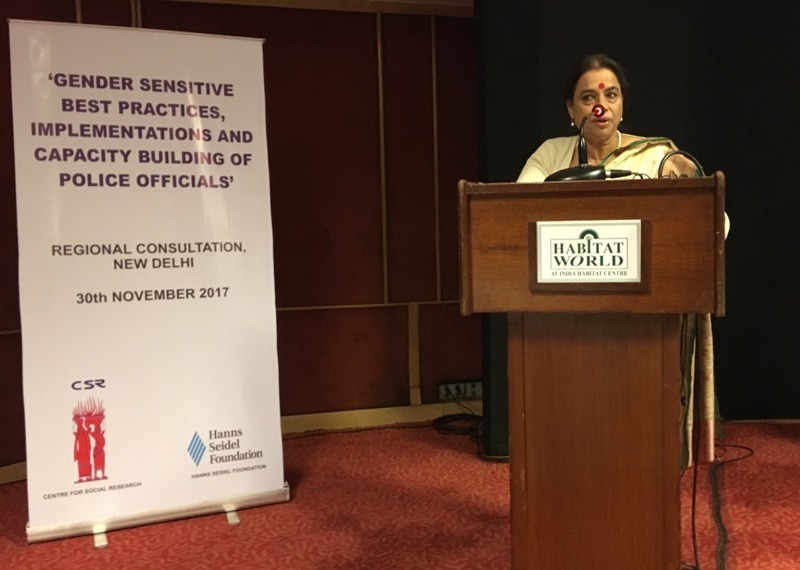 Many organizations who work on safe cities were present for the consultation and spoke on various aspects that must be considered as important for making a city smart by first ensuring that it is safe for everyone – especially women. 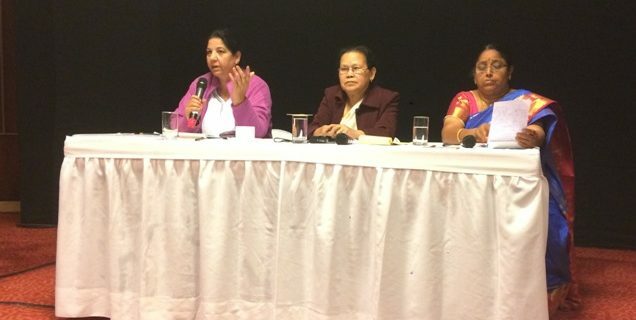 Among those organizations were Commonwealth Human Rights Initiative, Breakthrough, Indian Police Foundation, and People for Parity, Institute for Transport and Development Policy, the Chairpersons of State Commission of Women representing the states of Manipur, Jammu and Kashmir and the Union Territory of Puducherry. ADECOM, a civil society organization from Puducherry also spoke on crimes against women and the redressal mechanism for the same. Mr. Adab Singh Kapoor who is a prominent lawyer answered various questions on implementation of Domestic Violence Act and Ms. Pamela Singla who is a renowned professor at the Delhi University’s Department of Social Work, spoke on setting benchmarks that define perceptions around women’s safety. The Regional Consultation ended with collation of plethora of issues that comprehensively cover the subject matter and can lead to fine tuning the program intervention for future implementation. As December marks the end of the year 2017, Centre for Social Research is gearing up for the year 2018 to launch safe cities with renewed vigor. An All Women Patrol Wing in Udaipur – A First for India!